Pat Schlotzfodder of Priest Lake, ID submitted the winning entry for the 2013-2015 Sasquatch hunting stamp design contest. Pat's design is titled "Fearsome Frost" and captures the agressiveness of Sasquatch during winter months. 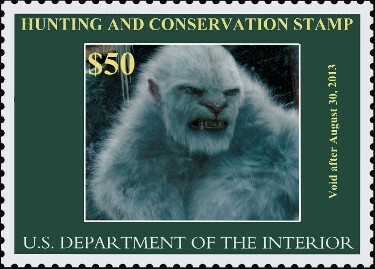 The National Sasquatch committee of the U.S. Department of Interior increased the $45 stamp price to $50 to help offset high legal expenses combatting the anti-hunting organizations in 2011-2012. This should cover legal fees as well as begin to build a small fund for any future needs. The increase was applauded by eastern states with the hopes of benefiting from full coffers by 2015. The stamp itself does not provide a person the legal opportunity to hunt Sasquatch. It is given to all participants in the national sasquatch lottery whether they are selected for a hunt or not. The cost to enter the lottery is the face value of the stamp - in 2013 and continuing to 2015 that is $50.